A crowd waiting for Donald Trump to speak Friday erupted after the presidential front-runner postponed his rally at the University of Illinois-Chicago Pavilion over safety concerns. "Mr. Trump just arrived in Chicago and after meeting with law enforcement has determined that for the safety of tens of thousands of people that have gathered in and around the arena, tonight's rally will be postponed until another date," an announcer said. "Thank you very much for your attendance and please go in peace." The crowd burst into shouts and cheers, and some scuffles broke out in the minutes after the announcement was made. Some people could be seen yelling at each other or making vulgar gestures; multiple punches were thrown. A man who took the podium was escorted away by officers. People could be heard chanting "Trump" shortly after. 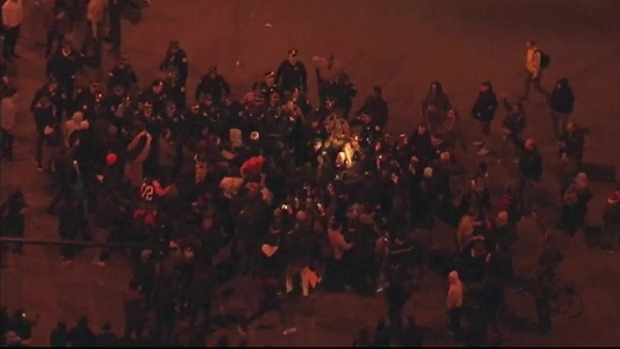 The protests spread to the streets around the University of Illinois-Chicago Pavilion, where a group of people were seen stopping cars. At a Friday evening press conference, Chicago Police said five people were arrested amid the chaos. Additionally, two CPD officers were injured – both non life-threatening -- though one officer was struck on the head by a bottle. 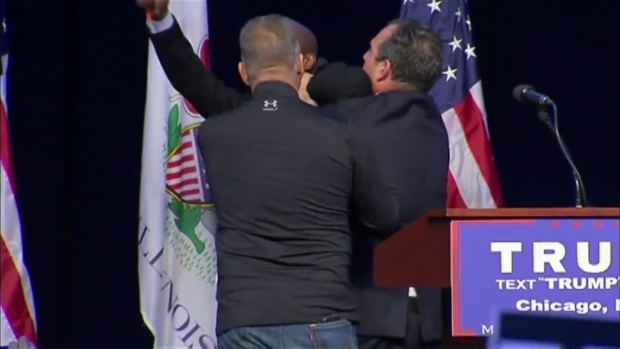 Jedidiah Brown was removed from the stage at the University of Illinois-Chicago Pavilion Friday after Donald Trump canceled his rally at the arena. Trump told MSNBC shortly after the announcement that he thought it was the "right thing to do under the circumstances." "My decision is: I just don’t want to see people hurt… We can come back and do it another time," he said. Mayor Rahm Emanuel released a statement thanking police for their work during the protests. 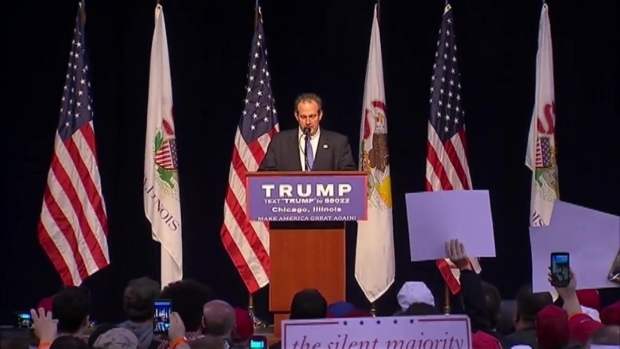 A Trump rep announces the Republican presidential candidate is postponing his UIC rally. The scenes brought reproach from Trump's presidential rival, Sen. Ted Cruz. Outside a dinner for Illinois Republicans, Cruz said Trump "bears a responsibility for creating" the kind of environment seen at the rally, and that its escalating is "the predictable consequence." Tensions were high even before the rally began. Protesters were already being escorted out of the UIC Pavilion an hour before the rally was scheduled to begin. Three attendees wearing shirts that read "Muslims United Against Trump" and "Make America Hate Again" were removed from the venue as protesters gathered inside and outside the pavilion. Crowds shouted as the protesters were escorted out before several people in the audience began repeatedly chanting "U-S-A." It was not immediately clear why the three were removed from the event. Another man was seen being taken out of the venue as some chanted "let him stay." Inside the rally, an announcement could be heard telling the crowd to "not touch or harm the protesters." "Mr. Trump will continue his right of free speech in America," the announcer said. "As a matter of fact, he supports the First Amendment just as much as he supports the Second Amendment. However, some people have taken advantage of Mr. Trump’s hospitality by choosing to disrupt his rallies by using them as an opportunity to promote their own political messages. 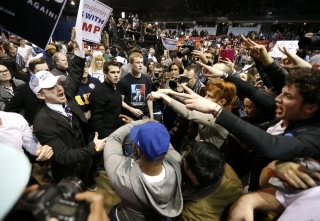 While they certainly have their right to free speech, this is a private rally paid for by Mr. 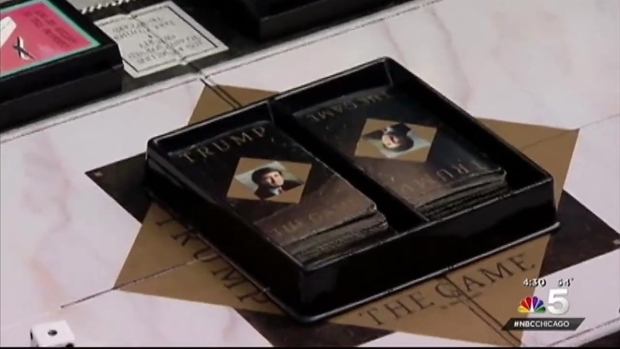 Trump." The announcer also told supporters at the rally if they see a protester, they can notify law enforcement by placing a rally sign over their head and chanting "Trump, Trump, Trump." Supporters of Trump began lining up at the building before sunrise Friday. The GOP front-runner was scheduled to speak at the school’s pavilion at 6 p.m., with doors opening at 3 p.m. The first person in line to wait for a spot at the free event arrived at 3 a.m. The arena seats 9,500, though it's not clear how many are set to attend the rally. More than 10,000 officially RSVP’d that they will be going to the university to protest the event. Ahead of Trump’s Chicago campaign stop, more than 50,000 people signed a moveon.org petition in an attempt to get the event canceled, saying it has no place in Chicago, “especially not at an institution of higher learning." Protesters cited the Republican’s stance on immigration, his calls to bring back torture tactics on alleged terrorists, and a recent endorsement from white supremacist David Duke. Trump is known for drawing large rallies where protesters frequently clash with supporters and security, but during Thursday night’s GOP debate he argued that he was not responsible for the incidents. “I hope not. I truly hope not,” he said. "People come with tremendous passion and love for the country. When they see what's going on in this country, they have anger that's unbelievable." As fury over Trump’s appearance grew, the school's chancellor, Michael Amiridis addressed the students' concerns, clarifying that the school was "not endorsing, sponsoring or supporting any candidate for political office." Rather, it was continuing its tradition of hosting campaign events on campus, and candidates could not be excluded "because of the views he or she expresses." Local politicians have also pledged to protest the rally, including Ald. Ray Lopez (15th Ward) and Congressman Luis Guitierrez. Illinois’ presidential primary will be held March 15.